The reason that I love to cook is directly correlated to how much I love to eat. When I’m cooking the most I’m cooking for up to 40 or 50 people per meal. So sometimes it’s hard to scale a meal down to cooking for myself. What I’ve learned though is that my freezer can be a great ally in reducing mess, preserving freshness, and giving me quick, convenient and incredibly delicious dinners. So, instead of scaling back, I’ll make a big batch, freeze parts and use it when needed. Here’s how it works with pizzas. I make my own crusts by hand. It’s easy and I feel like the act of kneading dough grounds me. I actually count the strokes as I knead – much like I count my breaths when I meditate. I don’t follow a recipe but follow a ratio instead. a handful of fresh rosemary leaves – there’s a wonderful aromatic property to rosemary baked into flour. Fresh doesn’t end up being so much like poky pine needles as dried. 1 teaspoon of yeast… no matter how high the water is multiplied. This recipe is NOT perfect – I usually just use a quart size yogurt container to measure and then add flour as necessary to get the right consistency. So here’s one of the main lessons from this post: You can make a big batch of pizza dough, divide it up and separate them out into sandwich bags and freeze them. The day you need pizza pull out a crust to defrost it, stretch it out, top it, and you’re good to go. No sticky bowls to wash out dough from…. fast, easy and delicious. You only need to let the pizza that you are making that day go through a rise; i.e. ou can place the stuff in the freezer directly after it is mixed and separated into sandwich bags. What you'll need. I pulled the ziplock out of my freezer a couple hours ago. Stretching out the crust. I also do this by hand by just pulling the dough between my hands and then rotating and pulling again. I can get the dough to the shape of the parchment paper that I’m going to bake it on. If the dough is resistent, let it relax a bit and then stretch it again. Through this method you can get incredibly thin crusts but also manage the shape easily. Topping. It’s whatever you prefer here but there is an order to it. 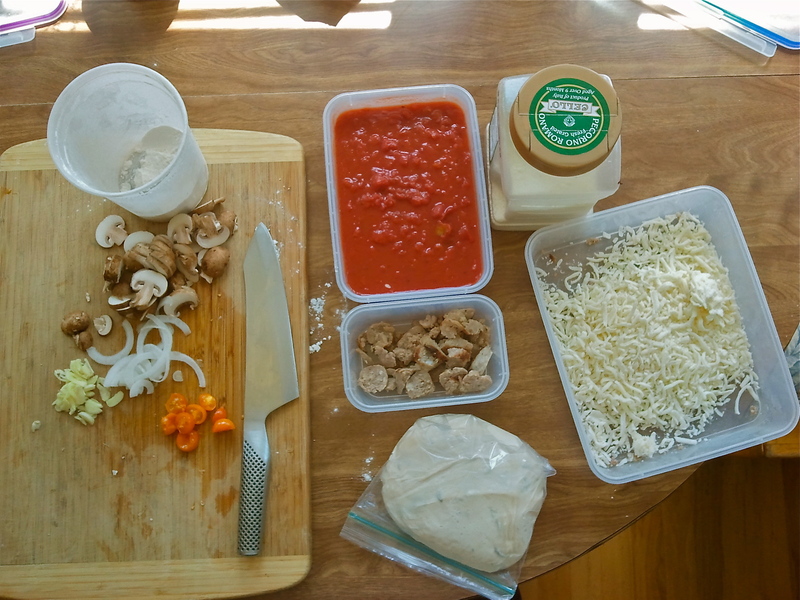 Sauce, then mozzarella, drier ingredients and then ingredients with a high moisture content. 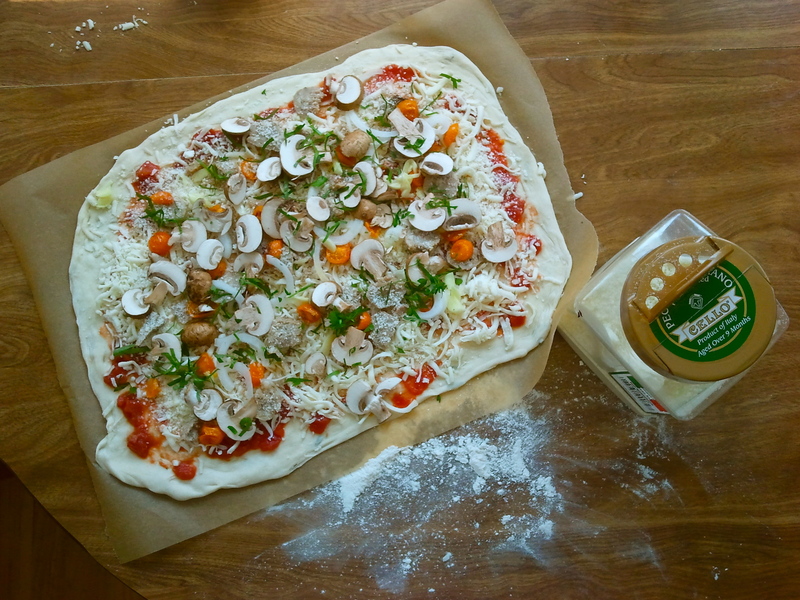 You want the mushrooms or peppers on top (not buried under cheese) so that the moisture can escape. You can, of course, give a light sprinkling of your hard aged parm on top – so you can still get that nice crusted top. Here’s the other main lesson from this post: Use Parchment Paper! Sure you’ve got this fancy pizza stone and you swear by it. However, you’re not maximizing the use of your oven shelf and I’ve seen plenty of pizza stones all sealed up with oil and spilt cheese rendering them unable to absorb the moisture that they are supposed to which results in a soggy crust. 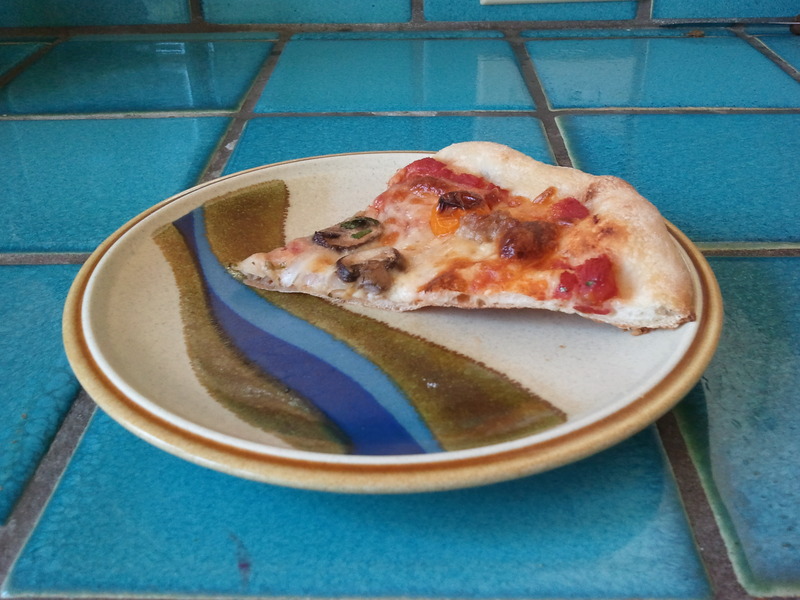 Take your pizza stone out and use it as trivet. I also don’t have a fancy peel. 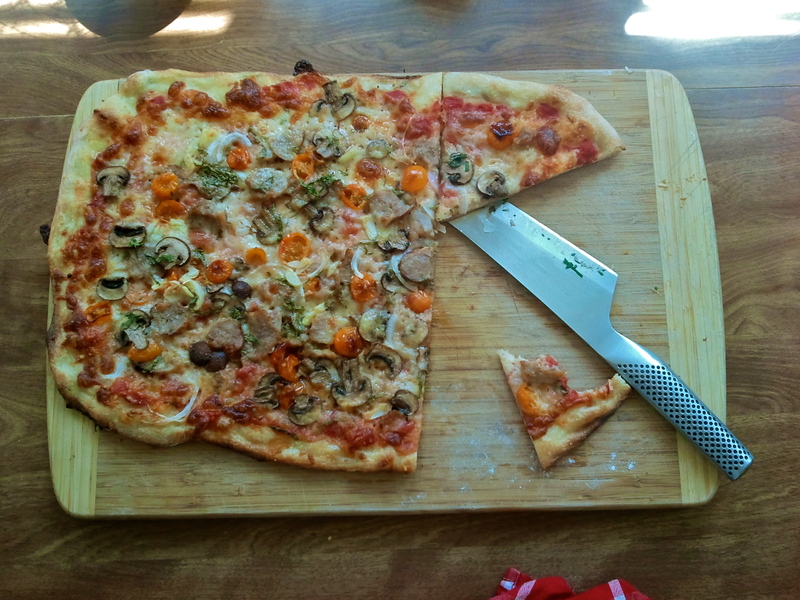 I either use a piece of corrugated cardboard or a cutting board. 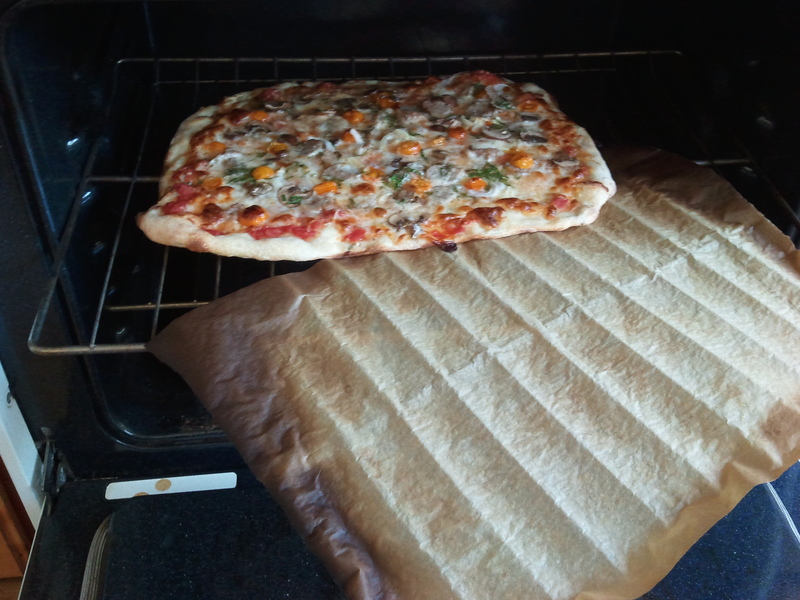 Parchment paper is easily slid in and out of the oven and will allow moisture to escape beneath it so you’ll end up with a super crispy pizza. 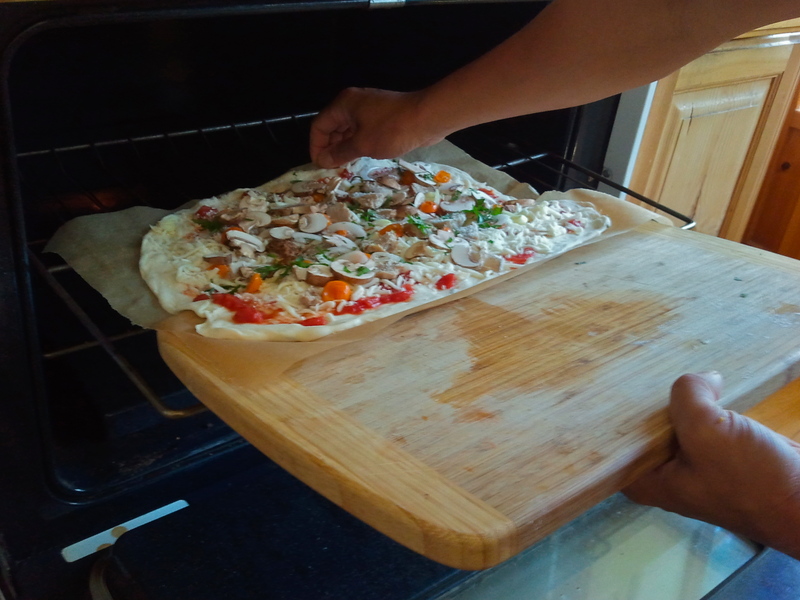 The oven is HOT – 475 degrees F.
Partly through the process, I’ll pull the parchment out from beneath the cooking crust. I can use this again for another pizza AND this exposes the bottom to even more heat to get it crispier. Your pizza is done when it is brown on top and crispy on the bottom. Cool it on a rack or serve immediately. You don’t want to leave it on a cutting board too long directly after taking it off the heat because the crust will still be trying to steam out and the steam will be trapped between the board and the crust. Here’s the final product. Super thin, crispy pizza! Notice how the bottom doesn’t sag into the plate? This just looks perfect, I love the photos so much!